There is no dress code. Sorry, we do not take reservations. Patrons must be over 21 years of age past 8pm. Parking is available by means of hotel and city lots, all located within a block of the club. 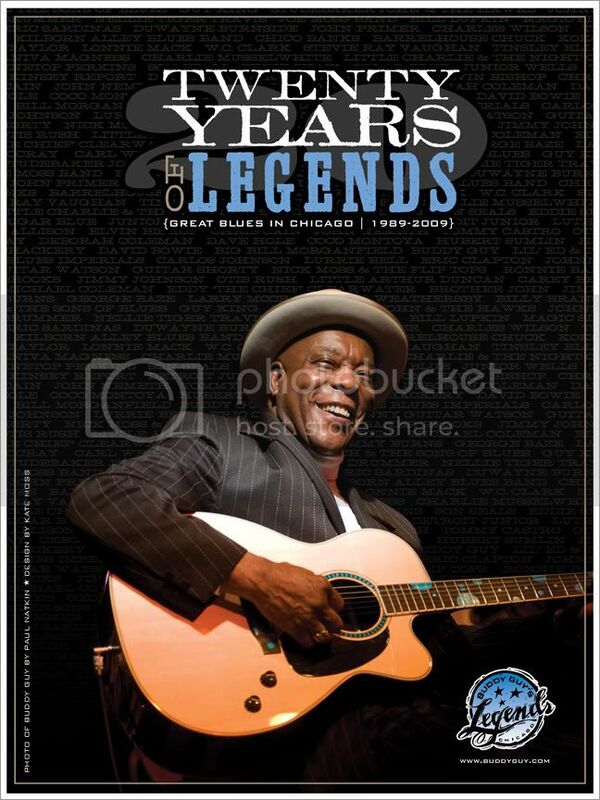 Since its opening in June of ‘89, Buddy Guy’s Legends has built a reputation as the nation’s premier blues club. Mr. Guy’s personal reputation as the crowned king of Chicago’s electric blues scene and his 50+ years in the music business have made Buddy truly a legend himself. As a blues club, Legends is distinguished for its innovative scheduling of local, national, and international blues acts. In the nineteen years that Legends has been open, the stage has been graced by some of the world’s most talented musicians. Van Morrison, Willie Dixon, Albert Collins, Bo Diddley, The Rolling Stones, The Black Crowes, Dr. John, Lou Rawls, David Bowie, ZZ Top, Junior Wells, Slash, John Mayer, Stevie Ray Vaughan, Greg Allman, and The Pointer Sisters are just a few examples of the talent that has graced the stage. Buddy Guy himself takes the stage every January, selling out over a dozen shows year after year, delighting crowds that have traveled from all over the world. While the Legends stage has played host to a myriad of true blues legends, the walls themselves talk, filled with pieces of Buddy’s and blues history. Where else can blues fans find original art work painted on the wall, records, rare photos and Grammys, along with personal items from some of the world’s most influential performers? You’ll see Koko Taylor’s evening gown from 1957; two of Buddy Guy’s Grammys and his Rock & Roll Hall of Fame statue; a photo of Buddy, Eric Clapton, and Stevie Ray Vaughan taken at Vaughan’s final concert. A world-renowned collection of guitars can be found over the main bar, signed by B.B. King, Carlos Santana, Eric Clapton, as well as Jimmy and Stevie Ray Vaughan. In November 1994, Eric Clapton graced the stage with three sold-out performances. The unprecedented concerts awed the crowd as Clapton called up Otis Rush to jam and nodded to the Who’s Pete Townsend, who had stopped by to take in the show. Legends truly lives up to its name. There is only one place in Chicago to experience the finest blues seven nights a week, enjoy southern Cajun soul food and behold a major archive of blues memorabilia. That place is Buddy Guy’s Legends. Voted “Best Blues Club” several times over by Living Blues Magazine, Citysearch, and AOL, Legends continues to be a mecca for the blues. Mick Jagger and Ron wood stopped in for an impromptu jam Sept. 11, 2002, during The Rolling Stone's stay in Chicago. Mick and Buddy Guy ran through a rendition of "Little Red Rooster" and Ron Wood played a few blues standards with Charlie Love's band. So what were they all drinking? Bottled water and coffee. As Buddy himself has become more of a household name, so has his nightclub become an icon of the local music scene. Although its large size may be less welcoming than many of the city's older clubs, it offers amenities that are a factor of that size: a tasty menu (shrimp Creole, jambalaya, barbecued ribs) and a great collection of blues memorabilia on the walls. The sight lines are reasonably good for a large room, although seating can be hard to come by if you don't get there early. Live blues is presented seven nights a week -- generally local acts during the week and national touring acts on Friday and Saturday nights. There's a jam every Monday and an acoustic blues artist on Friday, Saturday and Sunday. The talent level is consistent, and the waitstaff is cordial. As a bonus, its South Loop location is only a 10-minute ride from the Checkerboard Lounge, so you can visit Buddy's club and then compare it to his old haunt.